Ever thought it was stupid that your colonists couldn’t move some furniture around? That they had to destroy it and build a new one? The Miniaturisation Mod adds the ability to move the majority of benches and other small buildings around. 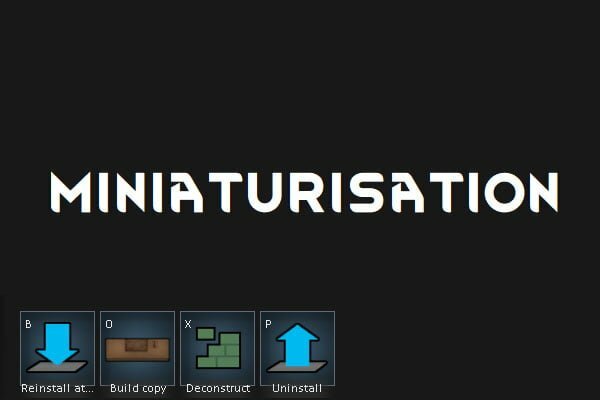 The Miniaturisation Mod is purely made in XML, no new mechanics are introduced. Benches introduced by other mods that use the same bae class will also be movable. If you wish to uninstall this mod, make sure that you don’t have any uninstalled buildings before doing it. Otherwise it should be completely safe. It is very common to start building a smaller base and then expand later on. So you’ll be repurposing rooms and moving stuff around constantly. With the Miniaturisation Mod you can now move buildings such as the cooking bench, and avoid having to set up all the bills every time you want to move it.